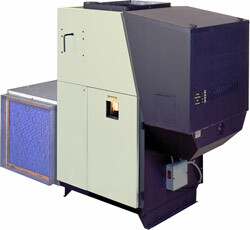 There are several different types of pellet heaters available. Based on the location choices you have available to you and your heating goals, one type will most likely meet your needs the best. You may need more than one unit in your home in order to satisfy your heating needs. These are guidelines only. Your pellet heating system professional will be able to help you determine which unit will fit your specific heating needs. find the pellet heating system for you. Pellet heat systems come in many different sizes and designs. Size, in terms of heating ability, is determined by consumption rate. In other words, how many pounds of fuel does the appliance use per hour. There is usually a low and a high number, giving you the range of heat output capable by the appliance. For example, if the appliance consumes 1.5 pounds per hour on low and 4 pounds an hour on high, the consumption rate is about 12,000 to 32,000 BTUs per hour. If the efficiency of the appliance is 75%, then you'll get 9,000 to 24,000 BTUs per hour into your home. Maybe that's kind of technical, but in general that's how pellet heaters are sized. From simple and clean styling for basements and utility rooms to elaborate enamel finishes for formal living rooms and bedrooms, pellet stove designs vary greatly. You’re sure to find an appliance that fits your home’s décor while meeting your heating needs. It's important to learn about the operation of the brand or model that you're interested in. Different brands and models have different control systems, maintenance procedures, and operational features. Your appliance dealer can explain the proper procedures for operating and maintaining your appliance. Pellet stoves are free standing heat systems. They can be installed in almost any room and are best used as a secondary focal point, meaning you may have another focal point in the room like an entertainment center, library, or picture windows. They can be installed against a flat wall or in a corner. Venting for the appliance can usually be installed directly out an exterior wall, straight up a few feet and then turn to go out an exterior wall (if in a basement), or straight up through a ceiling and roof. Make sure you are using venting appropriate for you installation. 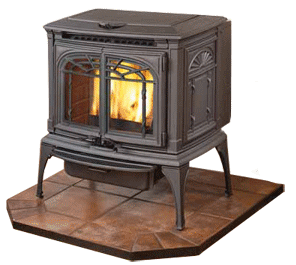 Most pellet stoves need a non-combustible surface on the floor. Pellet stoves are also a great replacement for existing wood stoves and can usually be positioned closer to a combustible wall than the wood stove, taking up less space in the room. Pellet inserts are normally installed in wood burning fireplaces. If you have a wood burning insert already installed in the fireplace, that will need to be taken out. Wood burning fireplaces can be either masonry site-built fireplaces, or factory built fireplaces. Either way, you will need to take measurements of your fireplace (height, width at the front and rear, and depth at the top and bottom) with you to your local appliance dealer in order to know what appliances will fit into your fireplace. If it's been used, you'll need to clean your fireplace and chimney before installation. Normally, part of the insert will sit back into your firebox and part of the insert will sit out onto your hearth. A surround panel will finish off the space between the insert and your fireplace opening, providing a clean and finished appearance. 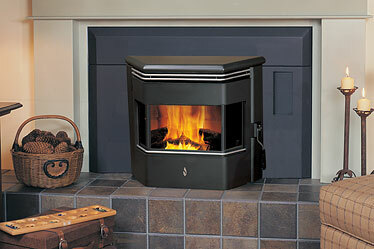 Pellet fireplace inserts are generally vented straight up through the existing flue. A continuous stainless steel flexible liner is the most common method. If you don't have a fireplace, but like the appearance of fireplace inserts more than a freestanding stove, many pellet inserts can be installed without a fireplace. Simply frame in a small alcove into a wall, or install a cabinet mantel, and the pellet insert can be placed in the opening and give the appearance of a fireplace. See the installation manual or ask your dealer if that type of installation is available. A pellet furnace or boiler can be used in conjunction with your existing central heating system. These more utility styled heat systems have larger fuel storage hoppers designed to hold several days use of fuel. They are normally installed next to your existing furnace or boiler with your existing heating system set up to use the pellet system as the primary heat source, and your existing furnace or boiler as the backup system set to come on if you were away and your pellet system ran out of fuel. Find a pellet heat system professional near you with our Affiliate Dealer locator!